When you think of Paris, you think of the Eiffel Tower, Notre Dame, the Louvre, the Champs Élysées. These are certainly very powerful images and recognised throughout the world. There is, however, a more modest symbol, nonetheless typical of this great city, that deserves recognition: the Wallace fountain. Or rather, fountains, as there are over 100 of them scattered throughout the city in all 20 arrondissements. These small cast-iron sculptures were installed in the 19th century by the British philanthropist Sir Richard Wallace and designed by the French sculptor Charles-Auguste Lebourg. Wallace, who inherited a fortune from his father, was already well known for his acts of charity. Paris was in a bad state at the time. During the Siege of Paris and the Commune the water supply infrastructure had been severely damaged. Prices rose so high that many poor people could not afford clean drinking water. Wallace, who was a genuine believer in good old fashioned Christian charity, felt morally bound to save the poor from turning to cheap alcohol. By funding the installation of water fountains he provided Parisians, rich and poor, with a reliable source of clean drinking water. Even today, his fountains are a valuable amenity to homeless people in the city. The original ("large") model stands 2.71 metres tall and weighs 610 kilograms. Standing on the solid base are four caryatids, representing the virtues of kindness, simplicity, charity and sobriety, who hold the dome of the fountain aloft. If you look carefully you'll notice that the four maidens are not identical; each has a slightly different pose and folds the bodice of her dress in her own way. The water flows in a single stream from the dome. 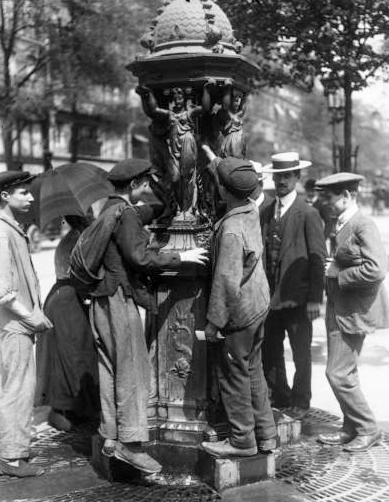 Originally there were metal cups attached to chains to facilitate drinking from the fountain, but these were removed in the 1950s for hygiene reasons. The water supply is switched off in the winter months to avoid the risk of damage due to freezing. There are other models of Wallace fountain, but this one is by far the most common. 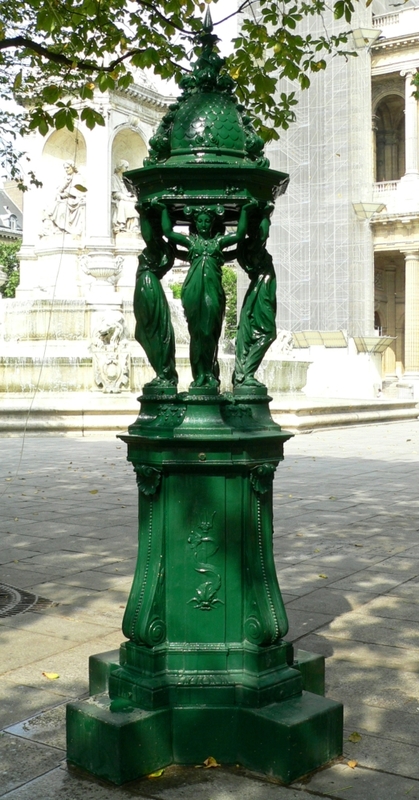 The fountains were manufactured in Sommevoire, a commune in the Haute-Marne department in north-eastern France. Richard Wallace, the philanthropist who gave Paris these precious and practical monuments, is buried in Père Lachaise Cemetery.